Two daily posts in a row? Wow, that’s a whole new thing here on the Portia Adams Blog! 2) gave me bad reviews as a result. Actually, I should put in here that at least three of these lovely fans identified the errors in their reviews and gave me four-star reviews DESPITE that, so a special thank-you to them! Regardless, I am here to admit that YES I have used words incorrectly in my novels. One of my kinder detractors was clever enough to include in her review this gif image from The Princess Bride so I’m stealing it for emphasis. One of the mistakes in Jewel of the Thames (if you haven’t caught it) was that I used the word ‘reticule’ incorrectly. 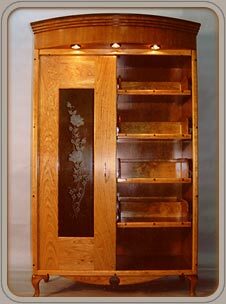 For some reason in my head it meant an armoire – the kind with glass doors where you might store chachkas or medicines (see right image). Yeah, I have no idea why that was what I thought it was, but it got all the way past my fabulous editor and into the book. Suffice to say we have since corrected it in the newest print run AND the digital copies of Jewel, but it continues to haunt me and cause some upsetting reviews. All I can say (fans and not-so-fans) is that I’m sorry; mistakes happen and this was one of mine. I have found errors in books I have read and never really thought too hard about it, nor have I posted about the errors in my reviews. I guess as a fellow-human I can understand how mistakes can happen, and usually the mistakes don’t stop me from enjoying the book. How about you guys? Do you get distracted by errors and review the books poorly as a result?